Includes everything that TTS SIlver does plus two one-on-one sessions per month. Athletes select from a variety of services for your two one-on-one sessions per month: video swim session, bike fit, run gait analysis, resistance training, etc. You choose based on your needs. 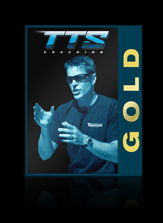 TTS Gold Coaching is $399/mo., with a 3 month minimum. Your account is billed monthly, and after the three month minimum you will have the option of altering your Individual Coaching plan, if needed. TTS Gold athletes are best served in the LA area, you are responsible for travel costs if your meetings are outside a 30 mile radius of Santa Monica, CA.